Unlock your iPhone's full potential. Is there a better alternative to iDemocracy? Is iDemocracy really the best app in System category? 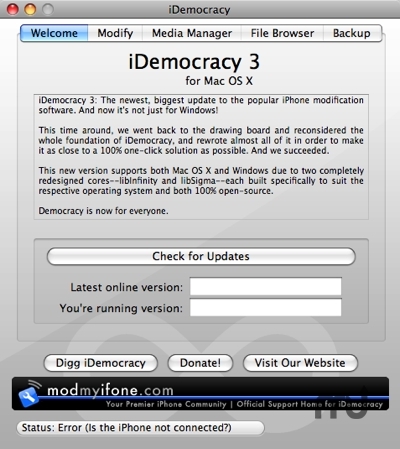 Will iDemocracy work good on macOS 10.13.4? iDemocracy brings 100% hands-free, automated iPhone modification. Just one click and you're done. We spent long hours refining the jailbreak and the utilization of the ramdisk exploit in order to unlock the iPhone's full potential, all through a clean, simple GUI. 100% redone from the ground up. Backup/Restore iPhone preferences and applications! Included fixes for Wi-Fi greyed out, etc. Media management for ringtones, wallpapers, and applications. File browser with upload/download capabilities, basic file I/O (more to come soon). iDemocracy needs a review. Be the first to review this app and get the discussion started! iDemocracy needs a rating. Be the first to rate this app and get the discussion started!